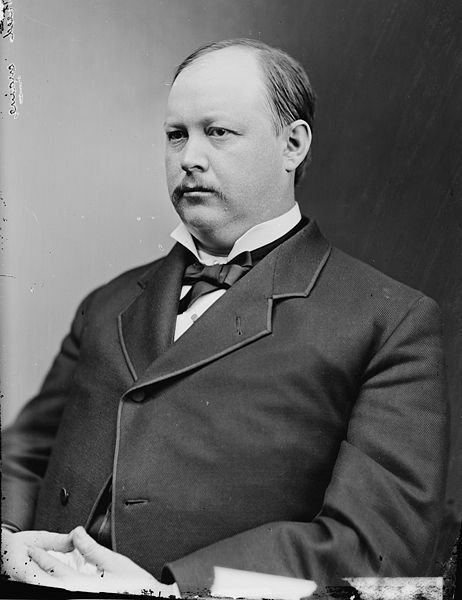 THOMAS BRACKETT REED was the rock-ribbed Maine Republican who led the U.S. House of Representatives into the modern era of big government. From the Speaker's chair early in 1890, he unilaterally stripped the legislative minority of the power to obstruct the law-making agenda of the majority. Enraged Democrats branded him a "czar," which epithet Reed seemed not to mind at all. Modernity was Reed's cause from his first Congress in 1877 to the day he resigned in protest over America's war of choice with Spain. As society was moving forward, he contended, so must the government and the laws. That meant, for instance, the abolition of capital punishment, a cause he championed while representing Portland in the Maine legislature immediately following the Civil War. On the national stage, it meant protective tariffs, peace, women's suffrage, federally protected voting rights for African-Americans and a strong navy. He heaped ridicule on the Democrats for their Jeffersonian insistence on strictly limited federal powers. The tragedy of Reed's political life was that the government he helped to cultivate and finance turned warlike and muscular, just as his Democratic antagonists had predicted it would. His friend and onetime protégé Theodore Roosevelt rode that trend into the history books. Reed, heartsick, retired to Wall Street to practice law. Peace and prosperity make a superior backdrop to everyday living, but they do not necessarily commend an era to the readers or writers of history. Not that either Reed's life (1839–1902) or his times were anything but eventful. Boom and bust, free trade or protection, race, the rights of subject peoples and the relationship between the individual and the state were the staple points of conflict during his quarter-century in politics. Czar Reed had a suitably tyrannical presence, standing well over six feet tall and weighing close to 300 pounds. He married a clergyman's daughter, Susan P. Jones, who opposed women's suffrage; Katherine, their daughter, lived to advocate it. Reed's eyes beamed with intelligence but his massive face was bland enough to stump the portraitist John Singer Sargent. "Well," Reed quipped as he beheld the painter's failed likeness of himself in 1891, "I hope my enemies are satisfied." The party labels of Reed's day may seem now as if they were stuck on backwards. At that time, the GOP was the party of active government, the Democratic party, the champion of laissez-faire. The Republicans' sage was Alexander Hamilton, the Democrats', Thomas Jefferson. The Republicans condemned the Democrats for their parsimony with public funds, the Democrats arraigned the Republicans for their waste and extravagance. And what, in those days, constituted extravagance in federal spending? Arguing in support of a bill to appropriate funds for a new building to house the overcrowded collection of the Library of Congress, Reed had to answer critics who charged that Congress should do without the books rather than raid the Treasury and raise up one more imperial structure to crowd the capital city's already grandiose thoroughfares. The library fight was waged with words, but the politics of Reed's time were shockingly violent. It was embarrassing to Reed to have to try to explain away to his congressional colleagues the near war that erupted in his home state over the stolen 1879 Maine gubernatorial election. Reed had grown used to political bloodshed in the conquered South, but even he, worldwise as he was, had never expected the descendants of the Puritan saints to have to call out the militia to get an honest count of a New England vote. Meanwhile, in Washington, on the floor of the House of Representatives, ex-soldiers would put aside public business to hurl charges and countercharges over the wartime atrocities at Andersonville or Fort Pillow. Reed himself was not above the occasional jibe at the ex-Confederates—"waving the bloody shirt," this style of political discourse was called—but he affected not one jot of martial vainglory. A supply officer aboard a Union gunboat on the Mississippi River in the final year of the war, he drew no fire except the verbal kind from his own commanding officer. As a professional politician, Reed could talk with the best of them. In the House, he was the acknowledged master of the impromptu five-minute speech and of the cutting, 10-second remark. He talked himself into 12 consecutive congresses, including three in which he occupied the Speaker's chair. "The gentleman needn't worry. He will never be either," he once remarked to a Democrat who was rash enough to quote Henry Clay's line about rather being right than president. Reed's wit was his bane and glory. An acquaintance correctly observed that he would rather make an epigram than a friend. Too often, he made an epigram and an enemy. "They can do worse," he said of the Republicans who were sizing him up for the GOP presidential nomination in 1896. "And they probably will," he added prophetically. In the museless and pleasant William McKinley, the Republicans did, in fact, do much worse. Mark Hanna, McKinley's strategist and the first of the modern American political kingmakers, set his agents to mingle in the western crowds that Reed sought to charm in the 1896 campaign season. "There was nothing Lincolnian about Reed, obese, dapper and sarcastic," Hanna's biographer recorded. "He wasn't too friendly when they came up to shake hands after meetings. He was an Eastern Product." That Reed fell short of the presidency was his contemporaries' loss, even more than his own. That he has made so small a mark in the modern historical record is a deficiency that this book intends to rectify. The Gilded Age produced no wiser, funnier or more colorful politician than Speaker Reed, and none whose interests and struggles more nearly anticipated our own. Reed, like us, debated the morality of a war that America chose to instigate. He wrestled with the efficacy of protecting American workers and their employers from foreign competition and resisted the calls of those who would cheapen the value of the dollar. He was—as it might be condescendingly said of him today—ahead of his time on issues of race and gender. Actually, in many ways, his views harkened back to those of the Founders. Too loyal a Republican to speak out against the McKinley administration's war in the Philippines, Reed would let drop the subversive remark that he believed in the principles set forth in the Declaration of Independence. Roosevelt wondered what had gotten into him. If Reed resigned from Congress in bitterness, he served with zest. He loved the House and especially the Speakership, an office, as he liked to say, that was "without peer and with but one superior." In parliamentary finesse and imagination, he was among the greatest Speakers. Such 21st century political scientists as Randall Strahan and Rick Valelly rank him on a par with the great Henry Clay of Kentucky. Reed's signal achievement was to institute an era of activist legislation to displace the prevailing system of party stalemate. Empowered by the rules he himself imposed, the Republican majority of the 51st Congress, 1890–92, passed more bills and appropriated more money than any preceding peacetime Congress. To critics who decried the appropriations record of that Congress—a shocking $1 billion—Reed approvingly quoted someone else's witticism: "It's a billion-dollar country." The overtaxed and -governed 21st century reader may wince at the knowledge that the hero of these pages was an architect of the modern American state—certainly, his biographer does. However, Reed did not knowingly set out to create Leviathan. He wanted not a big government but a functional one. He opposed what he took to be unwarranted federal intrusion into private matters, including big business, even though—to a degree—that business owed its bigness to the tariffs that the Republicans erected to protect it from foreign competition. In middle age, Reed found the time to teach himself French, but he stopped short at reading Frederic Bastiat, the French economist who demonstrated the compelling logic of free trade. The truth is that economics was not the czar's strongest suit—then, again, it has rarely been Congress'. Burning bright through the full length of Reed's congressional years was the question of what to do about money. Alexander Hamilton had defined the dollar in 1792 as a weight of silver (371¼ grains) or of gold (24¾ grains). Most of Reed's contemporaries agreed that the law meant what it said. Money must be intrinsically valuable, worth its weight, or something close to its weight, in one of the two precious metals. Paper money was acceptable only so far as it was freely exchangeable into the real McCoy. Let the government just print up dollar bills, as it had done during the American Revolution and again, under Abraham Lincoln, in the Civil War, and inflationary chaos would descend. In the final quarter of the 19th century, not a few Americans would have welcomed inflation with open arms. Falling prices were the norm; on average during Reed's political career, they fell by a little less than 2 percent a year. For debtors, the decline was a tribulation. They had borrowed dollars, and they were bound to repay dollars, but the value of the dollars they owed was rising. Thanks to material progress itself, the cost of producing goods and services was falling. Steamships had displaced sail, the automobile was gaining on the horse, and the telegraph and telephone were providing a fair preview of the wonders of the Internet. In consequence, prices fell even faster than wages did. Many Americans profited in the bargain, though a vocal minority lost, and this angry cohort did not shrink from expressing its demand for cheaper and more abundant dollars. Silver was a cheaper metal than gold, and paper was cheaper than either. Let money, therefore, argued the populists, be fashioned out of these common materials, the better to serve a growing nation and not incidentally lighten the debtor's load. For most of his public life, Reed took the opposite side of the argument. Supporting the gold standard, he contended that a stable, value-laden dollar best served the interests of all, wage-earners not least. As pro-inflation sentiment was rife in Maine, Reed maintained his hard-money view at some political risk to himself. He hewed consistently to gold until the mid-1890s, when the monetary battle was raging hottest. And then, to some of his friends' despair, he casually indicated a preference for bimetallism, the monetary system under which gold and silver cohabitated (and in which gold was likely to be driven from circulation by the cheaper, and cheapening, alternative metal). To uncompromising gold-standard partisans, Speaker Reed suddenly seemed to go soft when he most needed to stand tall. Reed's mordant sense of humor was oddly out of phase with his upbeat view of the human condition. Unlike his friend Mark Twain, he was prepared to contend that reason was on its way to banishing war, purifying religion and eradicating poverty. For Reed, there was no bygone Arcadia; always, the best was yet to come. But not until he took matters into his own hands was there anything on Capitol Hill to resemble the ingenuity of Thomas Edison or Alexander Graham Bell. Until what were known as the Reed rules took force in 1890, the House was hostage to its own willful minority. If those members chose to obstruct, they would simply refuse to answer their names when the clerk called the roll. In sufficient numbers, sitting mute, they could stymie the House, which, under the Constitution, requires a quorum to function. Present bodily, they were absent procedurally. So for weeks on end, the main order of business might consist of parliamentary fencing and the droning repetition of roll calls, each absorbing 20 or 25 unedifying minutes. The 50th Congress, either notorious or celebrated for its inactivity (depending on one's politics), contributed 13 million words to the Congressional Record on the way to no greater legislative achievement than the institution of the U.S. Department of Agriculture. By contrast, the 36th Congress, as recently as 1859–61, while debating war and peace, union and secession, freedom and slavery, had uttered just four million. Reed, elected Speaker for the first time in the 51st Congress, transformed the House by declaring those members present who were actually in the House chamber, whether or not they chose to acknowledge that fact by opening their mouths. Democrats excoriated him for doing so, their rage compounded by Reed's seeming imperturbability under fire. Not that they were alone in their disapproval. The voters, deciding that Reed had overreached, handed the House Republicans (though not Reed himself) a lopsided defeat in the congressional elections of 1892. By and by, Reed lived to see both himself and his rules vindicated, the Democrats themselves coming grudgingly to adopt them in 1894. Reed, a first-term congressman at the age of 37, had seen something of the world as Maine legislator, attorney general and Portland city solicitor. His political education continued in Congress with service on the commission to investigate the crooked presidential election of 1876. Each party had attempted to steal it, the Republicans finally out-filching the Democrats. Reed, as partisan a politician as they came even in that partisan age, distinguished himself in the investigation by bringing to light Democratic malfeasance while explaining away (or trying to) Republican offenses. Reed held sacred the right of majority rule. Especially did he hold that right dear, as a journalist of the time dryly remarked, when he agreed with the majority. But the majority and Speaker Reed finally parted company in 1898 over the administration's program to add to American possessions in the Caribbean and the Pacific. From the Speaker's chair, he engaged in his rearguard actions against the war. Holding up the Hawaiian annexation measure, for instance, he refused recognition for the members' pet hometown appropriation measures on the grounds that "the money is needed for the Malays," or—concerning a proposed Philadelphia Commercial Museum—"This seems like a great waste of money. We could buy 15,000 naked Sulus with that." Reed was as prone to error as the next mortal legislator, but he was inoculated against humbug. The language of McKinley's aggressive foreign policy brought out what may seem now, with a century's perspective, the best in him. "It is sea power which is essential to every splendid people," declaimed Henry Cabot Lodge, a close friend of Reed's—and of Roosevelt's too—in the Senate during the run-up to war. Said Reed, simply and winningly, "Empire can wait."